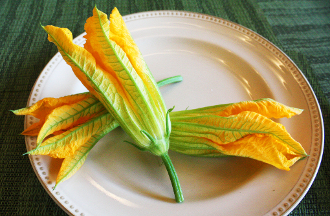 Our squash blossoms are of the highest quality. Bright yellow flowers with a sweet, mild zucchini flavor, great tender texture, and are longlasting. Endless cooking possibilities; often stuffed with cheese, herbs, seafood or meat, and fried. They can also be used as a pizza topping, or an addition to risotto, pasta, quesadillas & frittatas. Can be eaten fresh, added to salads or used as a wonderful garnish for any entree.